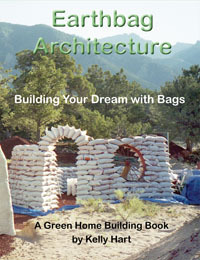 Patti Stouter has been running a series of very interesting, even surprising, experiments with various materials that might be used to insulate earthbag walls. 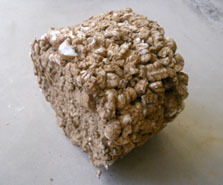 She has focused her attention on light-weight natural or recycled materials that can be bound together with a clay slip. She devised a test apparatus to measure how well the materials impede the flow of heat, using a 4? thick sealed beadboard box (15? cube on outside) with a 6? 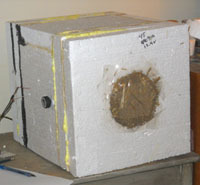 diameter opening on the top, where she packs her various materials to be sampled. A precision resistor attached to a regulated power supply heats the inside and there is a digital thermometer that reads in 1/10 of a degree F. When the inside of the box reaches a steady state she measures the difference between the temperature inside the box and the room temperature. She calibrated the devise with some standard insulating materials with known R-values. The above graphs illustrates the results of her experiments. Because both EPS packing peanuts and strips of grocery bags would emit toxic fumes if they burned, she has designated these for exterior use only. 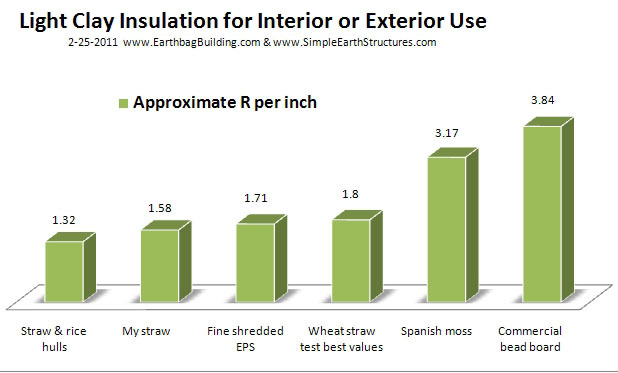 In actuality it is generally better to place any insulation materials on the exterior in order to isolate the thermal mass of packed soil on the inside. What is surprising is how extremely well some of these materials performed. 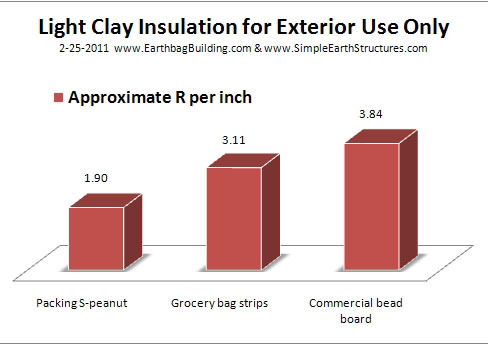 Both Spanish moss and grocery bag strips measure at over R-3 per inch! These test samples were made with a moderate strength silty clay, and materials might be stronger and lighter if made with a more plastic clay. The sample at right is made with the packing peanuts. Other possible light clay components are sea grass or eelgrass, coconut fibres, reeds, or mica. 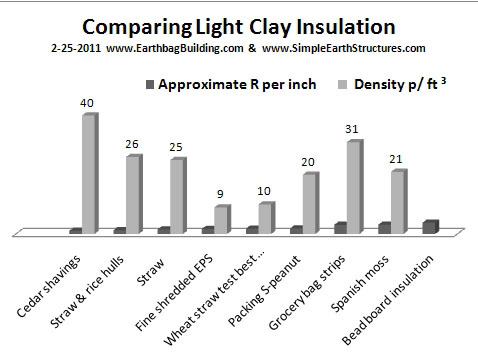 If you are interested in the density or weight of the various materials she used, the above graph shows this.